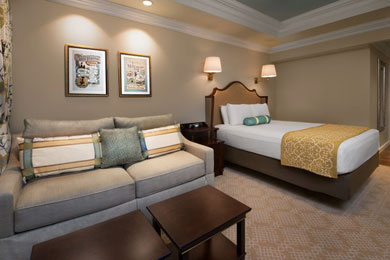 The Villas at Disney’s Grand Floridian Resort & Spa is Disney World’s 12th Disney Vacation Club property and the first to feature studios that sleep up to five guests. 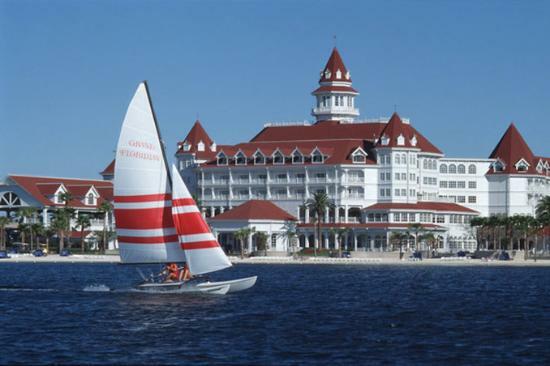 The all-white, red-shingle roofed building is in keeping with its elegant Victorian-designed Grand Floridian neighbor, yet has many clever features of its own. There’s the lobby’s Mary Poppins-themed bronze fountain with playful penguins, elevators with umbrellas that point to floor numbers, and villas with numerous hidden storage spaces, including a disguised fold-down bed with custom art inside. 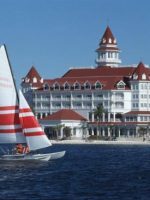 Unlike some Disney Vacation Club properties, which have their own restaurants and recre-ation facilities, the Villas at Grand Floridian are dependent on the Grand Floridian Resort for all dining and recreation options, which is only a short stroll away. 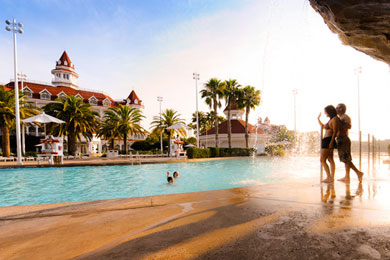 In addition, the vil-las’ location adjacent to the beach and along the path toward Disney’s Polynesian Village Resort offers two perks some of Grand Floridian’s other lodge buildings don’t: quick access to the Beach Pool and Grand Floridian’s stand-alone spa and fitness center building. Overall, it’s easy to see why this property’s elegant and roomy villas, combined with the fantastic location near the monorail and many of Disney’s most beloved restaurants, have made it a family favorite since opening in October 2013. The property's 147 units include studios, one- and two-bedroom villas. Each features crown molding, porcelain tile on the balconies, and a room design that maximizes space in a way that's similar to Disney's cleverly designed cruise ship cabins, with hidden storage areas and a bath-and-a-half design (stand-up shower and sink in one room; full tub, toilet, and sink in another). In addition, all studios and villas feature a hidden bed. What first ap-pears as an elegant cherry wood and glass dresser below the TV, is actually a pull-down bed with a surprise -- a lovely painted image across the back wall of a sleeping Dumbo and his mom that says "Sweet Dreams," or sleeping children with poems about sleep. Because of these pull-down beds, there are no rollaway beds available. Views are either of the lake or anything that doesn't overlook the water -- parking lots, courtyards, landscaping or the monorail. Additional amenities include two plush bath robes (per bedroom), full-size hair dryers, free Wi-Fi, in-room safes large enough for laptops, mirror TVs in all bathrooms, Blu-Ray players, Pack 'n Play cribs, clock radios and at least one flat-screen TV. The 374-square-foot deluxe studio villas sleep up to five people with one queen bed, a queen sofa bed and a twin pull-down bed. The compact kitchenette area has the basic ne-cessities for fixing snacks or small meals, including a mini-fridge, toaster, coffeemaker, mi-crowave and sink. One-bedroom villas are 844 square feet and two-bedrooms are 1,232 square feet. Each fea-tures a living room with a broad loom area rug, thick-cushioned couches (that double as beds) and a large dresser-like piece that's a pull-down bed. Storage can be found in the fab-ric-covered ottomans, as well as in drawers built in to a half-wall behind the banquette ta-ble. In addition, each villa has a stackable washer and dryer. The full kitchen rivals anything you'd see in an upscale apartment and includes beveled subway tiles, granite countertops, a farmhouse sink, seeded glass cabinet doors, upgraded appliances and a banquet table. There is also unique artwork throughout, from classic Vic-torian silhouettes, to themed songbook covers and framed "Mary Poppins" cut-outs. Master Bedrooms have decorative wainscoting, crown molding and dimmable lights over the bed. Master Bathrooms have a mirror with a built-in TV, freestanding Victorian-style tub with air-bubble jets, mosaic marble tile and a walk-in master bath shower. Two-bedroom villas have a full second bathroom with a sink, shower, toilet and tub that is ac-cessible from the living room and entryway. There are six Grand Villas (2,800 square feet), which have four bathrooms and three be-drooms that sleep 12 (plus an infant). The master bedroom has a king bed, and the second and third bedrooms each have two queens. 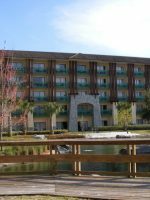 All have views of the Seven Seas Lagoon and a private porch or balcony. Note: While Grand Villas can be booked by renters, they are often booked well in advance by Disney Vacation Club Members. Stayed at the Grand Floridian from 4/11-4/18 in a club level room in the main building and were blown away from start to finish - we didn’t want to leave! Check in staff were helpful and friendly, and noted that we were there for our son’s 9th birthday. They gave him a button to wear, and he was hearing happy birthday from cast members everywhere we went, which made his day. The club level service was wonderful. The dedicated club concierges were friendly and knew our names when we walked by. Jacinthe was especially nice and friendly and cheerful! Getting from the hotel to the parks was easy - whether it be monorail, bus, boat, or MinnieVan. On our son’s birthday, a wonderful birthday surprise was waiting for him in our room when we got back from the parks, and it made his day even more special. All of the cast members at the Grand Floridian were always nice and cheerful. From the restaurant staff to the housekeepers to the staff out front, never saw anything other than a smile and a friendly greeting. We will definitely stay here again in the future. 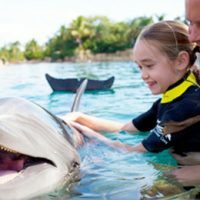 We have stayed here 3 times and whilst we can’t compare it with the other Disney resorts we really feel it’s the best of the Disney resort options. We had a club level room in sugar loaf, my advice would be to not have a room around the atrium, especially on lower levels as the noise from food service is pretty loud. I’m not 100% sure club level is worth it. You get selected food options at breakfast, 11, lunch, pre dinner and evening desert. But if like us you spend all day in the parks you really only get the breakfast and occasionally pre dinner bites or desert. Food options are not very accommodating to vegetarians and I don’t think Disney have even heard of the word vegan so be warned. You do get beer and wine inc whilst food is served, and tea and coffee is pretty much round the clock. Overall thumbs up from us and we would definitely stay again. Extra bonus is the monorail stops in the hotel and 1 stop takes you right to the magic kingdom. Have a magical day!!! The Beach Pool, located near the beach and closest to the Villas, has a 181-foot-long waterslide that curves down a faux mountain and slides under a walking bridge before plunging guests into the pool. In addition to the slide, the pool has a gradual slope entry and a water play area for little ones. The pool area is also home to a variety of games each afternoon (from 1 to 5 p.m.) that include relays, rubber ducky games, trivia, "finish the lyr-ics," plus an "unbirthday pool party." Water depth ranges from gradual entry to 4 feet, 3 inches. Children under the age of 12 must be accompanied by an adult. Pool hours and life-guard availability change seasonally. Be sure to review the monthly Recreation Calendar that you'll receive at check-in to confirm times. The Courtyard Pool is the resort's largest and includes an adjacent kiddie pool, small sprays near the gradual entry side and an oversized whirlpool spa, all set amid the resort's color-fully-landscaped central courtyard hub. There's also a Ping-Pong table on the pool deck. Depths range from gradual entry to 4 feet, 11 inches, with several 2-foot areas for young swimmers. NOTE: Swim diapers are required for children who aren't toilet trained and are available at Sandy Cove Gifts. Cabanas are available for full- and half-day rentals. Once the Mouseketeer Club, this former kids' club area has been transformed into an ar-cade filled with classic games like Donkey Kong and Star Wars, plus air-hockey and the "Claw," the arcade game made popular by "Toy Story"; this one is full of plush Disney char-acters for the claw to attempt to grab. Arcadia is open 8 a.m. to 11 p.m. daily. Held at 1900 Park Fare, this kids-only hour of games, stories, crafts, "tea" (aka apple juice) and cupcake decorating, is for pint-sized partiers ages 4 to 12. Disney characters from "Al-ice in Wonderland" are part of the fun. The event is typically offered Monday through Fri-day from 2 to 3 p.m. Advance reservations are recommended. The cost is $49 per child, plus tax. Located near the Beach Pool, this fun interactive structure has sprinklers, two mini waterslides, teacups, teapots and a large Mad Hatter's hat that pours water on waders be-low. Disney movies (rated G or PG) are shown each night at 9 p.m. near the beach. Check the Recreation Calendar to confirm the time and show listings. Kids board the pirate ship at the Grand Floridian Marina, then visit "ports of call" along Bay Lake and Seven Seas Lagoon to follow clues and discover treasure. Voyages run Monday through Saturday, 9:30 to 11:30 a.m. and include a snack and drink. 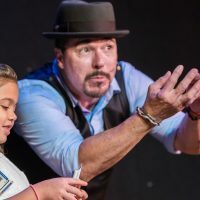 The Pirate Adventure Cruise is geared toward potty-trained kids ages 4 to 12. Here, you can rent a Boston Whaler 170 Montauk ($45 per half hour for six guests), a 21'-foot SunTracker family pontoon boat ($45 per half hour for up to eight guests) or a Sea Raycer mini powerboat ($32 per half hour or $45 per hour). If you want to splurge, there's the Grand 1, 52-foot Sea Ray Sedan yacht, which can accommodate up to 18 guests. Prices start at $745 per hour and include a Captain and deckhand. You can also book a captained pontoon specialty cruise. The 21' SunTracker family pontoon boat ($299 for up to 8 guests) or a 25-foot that accommodates up to 10 guests ($349) in-cludes snacks and soft drinks service. Additional private dining is available for an extra fee. These cruises run morning, afternoon and evening, and prices vary based on time. Evening cruises allow you to drop anchor and watch the Magic Kingdom Fireworks show. Visit the concierge desk or the marina for reservations. There is a fenced in basketball/sports court, and a cabinet stocked with balls, located next door to the spa and barbecue grill area. Located on Grand Floridian's first floor, Sandy Cove Gifts and Sundries is the place to stock up on milk, bread, fruit, drinks, snacks and other basics for your villa, as well as medicine, suntan lotion, stamps and resort logo items. Also on the first floor, Summer Lace is home to ladies' designer clothing, including swimwear, casual shoes, jewelry, makeup, hair accesso-ries and more. Upstairs, close to the monorail, is M. Mouse Mercantile, the place for Disney-themed games (think Disney versions of Life, Monopoly and more), costumes, toys, pin-trading and chil-dren's clothing. Around the atrium from M. Mouse is Commander Porter's, home to men's golf shirts, cigars, watches, casual shoes and designer labels, including Vineyard Vines. Lastly, don't miss the colorful, olfactory overload available at Basin White, a bath and body store stocked with "bath bombs," scrubs, and fun transparent soaps with pictures of every-thing from goldfish to flip-flops to turtles. The Villas building itself doesn't have restaurants or food stores, however, you can find everything from grab-and-go service to elegant restaurants at the Grand Floridian. In addi-tion, the Villas building is just a half-mile from the the Polynesian's Kona coffee and other island-fare specialties. 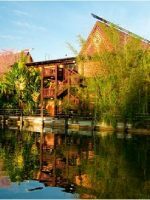 See the Polynesian Village Resort review for restaurant specific information. Located closest to the Villas, this outdoor bar and grill is housed in a large white gazebo with tables scattered poolside. Open 11 a.m. to 9 p.m., kid-friendly menu items (for ages 9 and under) include burgers and pizza, plus "Mickey Check Meals." These meals, available at most Disney eateries, include choices that limit calories and meet nutrition guidelines for saturated fat, sodium and sugar. Options include grilled chicken breast with honey-wheat bread, lettuce, tomatoes, carrot sticks and grapes. The adult menu includes salads, sandwiches, and the Florida EscabÃ¨che, a shrimp and scal-lops dish served with multi-colored chips. The gazebo bar serves frozen drinks, wine, beer and a popular Black Cherry Lemonade made from Grey Goose Cherry Noir Vodka and lem-onade. 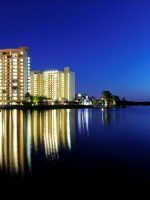 The location is great for a poolside lunch, or as a casual dinner with views of the nightly Electrical Water Pageant on the Seven Seas Lagoon. Located next to the resort's largest pool, this bar area has TVs, specialty cocktails, beer, wine, sangria and a slightly smaller menu of snacks and lunch items, in comparison with the Beach Pool Bar & Grill. Overlooking the rose gardens and the courtyard pool, this casually elegant (and moderately priced) restaurant is open for breakfast, lunch, and dinner. Breakfast choices include Min-nie's Grand Cake (pancakes) and a decadent lobster Eggs Benedict. For lunch, there's sal-ads, soups, sandwiches and two burger choices you don't see on most menus: Falafel and Surf and Turf. Some of the same selections are available for dinner, plus pasta, chicken and steak entrees. Mickey Check Meals are available here as well, and include salmon and chicken options. Beverages favorites include a Godiva chocolate martini, and, for kids, a fun Tinker Bell and Friends, or Buzz Lightyear Punch, served in the respective souvenir cup with a glowing Tinker Bell or Buzz Lightyear clip-on light. This is Grand Floridian's home for buffet meals and character dining, where some of Dis-ney's oldest and most beloved characters visit tables and converse with guests. The Super-califragilistic Breakfast buffet includes custom-made omelets, mini pancakes, Mickey-shaped waffles, carved ham, bakery items, fruits and more. While appearances by all char-acters are not guarenteed, Mary Poppins, Alice in Wonderland, the Mad Hatter, Tigger and Winnie the Pooh are regulars. Cinderella's Happily Ever After Buffet Dinner is themed after "kingdoms" from around the globe and hosted by Cinderella, Prince Charming and other characters from this classic fa-ble. Buffet choices include seafood, salad, pasta, and beef dishes, as well as kid-friendly fa-vorites, pizza and macaroni and cheese. While the characters are each buffet's main feature, the room's decor is something to be-hold too, with carousel sculptures that include horses and a galloping green seahorse, plus a late-1800's Limonaire French band organ. Located on the back side of the main building, facing the marina, Gasparilla's is Grand Flo-ridian's quick-service restaurant, open 24 hours. Here, you can grab a hot breakfast until 11 a.m. and made-to-order grill items until 11:30 p.m. Sandwiches, burgers, pizzas, soups, sal-ads, grab-and-go items, desserts, beer and wine are available, too. 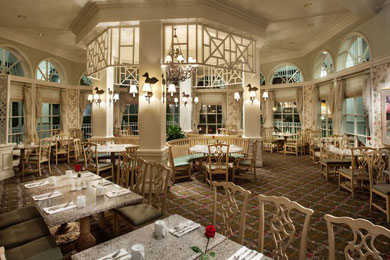 Located on Grand Floridian's first floor, afternoon tea is served daily between 2 and 5 p.m. The tea service features international teas, a selection of petite sandwiches, scones, and pastries (some shaped liked tiny swans) and other sweet treats. Music begins at 3 p.m. each day, featuring either a piano player or live band. The Perfectly Princess Tea Party is held here on select days at 10:30 a.m. for children and at least one adult. Young princesses and princes can join in sing-alongs and dances, and listen to the story of a magical rose from Aurora's garden. Little girls often dress as their favorite Disney Princess to feast on heart-shaped PB&J sandwiches, ham and cheese sandwiches, grapes and Princess Cake. Adult fare includes a selection of cheeses, tea sandwiches and more. Parting gifts are a favorite part of the expe-rience. Princesses receive an 18-inch My Disney Girl doll dressed in a Princess Aurora gown, a tiara, silver princess bracelet and more. Young princes receive a sword and shield, plus a plush Disney bear. Children must be accompanied by an adult. Afternoon Tea is a la carte. Prices vary depend-ing on selected tea service. Advance reservations are highly recommended and can be made up to 180 days prior to your visit. Wrought-iron railings that resemble vineyard grapevines and old World furnishings are a few of the things that set the mood in Grand Floridian's largest restaurant. You can request (not guaranteed) a table overlooking the courtyard, or one with views of the bustling open-air kitchen. Fresh, seasonal ingredients influence the oft-changing menu, which might include sautÃ©ed shrimp, braised veal shank, pan-roasted chicken, or oak-grilled filet of beef. Leave room for the warm chocolate-banana torte. Kids' menus are available. Reservations are recommend-ed. This octagon-shaped, open-beamed restaurant specializes in fresh seafood, and is located at the edge of Seven Seas Lagoon. Whole-steamed Maine lobster, Coriander and Shichimi-spiced Seared Ahi Tuna, and pan-seared Georges Bank Day Boat Scallops are a few favor-ites. Steaks and chicken with gnocchi are also available. Better still are the spectacular views of the nightly Electrical Water Pageant and Wishes Fireworks over at Magic King-dom. Kids Mickey Check Meals choices include oven-roasted shrimp and pasta with house-made tomato sauce. This restaurant typically books up faster than Citricos, so reservations are highly recommended, especially if you want a seating time that coincides with viewing the water pageant (usually 9:15 p.m.) or fireworks (closer to 10). The soundtrack is piped in to the restaurant for both. Dress code is business casual; slacks, jeans, or dress shorts and col-lared shirts are required for men. Women typically wear dresses, skirts, capris, or dress shorts, with a sweater or blouse. The villa kitchens are as beautiful as you'd find in many homes, perhaps making cooking on vacation an enjoyable chore. Ask the concierge for a list of grocery delivery services or stock up on items at the Sandy Cove Gifts and Sundries. In addition, there are gas grills for villa guest use, located near the spa. Guests must be at least age 16 to use them. Independent childcare provider Kid's Nite Out offers one-to-one babysitting in resort rooms and villas. Most sitters do arts and crafts, read and play games with kids ages 6 months to 12 years. All guests receive a birthday or an "I'm celebrating!" button if they are celebrating a birth-day or special occasion. Also, while not a welcome amenity, cast members occasionally sur-prise kids with activity books and crayons. This full-service spa offers massages, facials, manicures, pedicures and other perks such as a back or scalp facial. Kids ages 4 to 12 have their own spa menu that includes a 25-minute manicure or pedicure. Guests under the age of 18 must be accompanied by an adult. The spa is open 8 a.m. to 8 p.m. The fitness center has a full circuit of Life Fitness equipment, treadmills, stationary bikes and free weights, and is open to Grand Floridian and Polynesian resort guests 24 hours. Some units have in-room washers and dryers, but the resort also has laundry rooms that are open 24 hours for guests to use. They are all self-service machines and fees apply. Onsite parking is complimentary for all guests. January to mid-February, late July to October, and post-Thanksgiving through mid-December are typically when you'll find the best pricing, as well as smaller crowds and shorter waits for rides and restaurants. There are discounts available for active and retired military members, as well as certain geographic resident discounts at various times of year. Disney's complimentary Disney's Magical Express service allows you to check your bags at your hometown airport, bypass baggage claim at Orlando International Airport and take Disney's comfortable motor coaches to the resort (while you watch classic Disney short flicks and test your Disney trivia knowledge). Once you arrive at the hotel, your bags "mag-ically" appear, albeit a while after check-in. The service must be booked in advance and is not available with all airlines. If your airline is not a program participant, you can still take the complimentary bus; just claim your bags in baggage claim, then head to Disney's Magical Express desk in the airport for your bus as-signment. Note: Return bus service is scheduled roughly three hours prior to flight time. 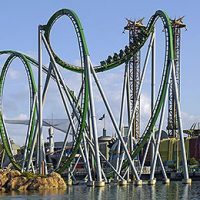 For those driving and/or renting a car, the resort is 24 miles from Orlando International Airport. It's easy to get around Disney World from the Villas. 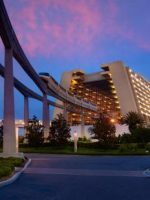 The Grand Floridian Monorail station is a quarter-mile walk from the Villas main entrance. 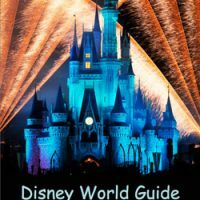 Magic Kingdom, Contemporary Re-sort, Polynesian Village Resort, and the Ticket and Transportation Center (for Epcot) are all accessible via Monorail, which is free to ride. 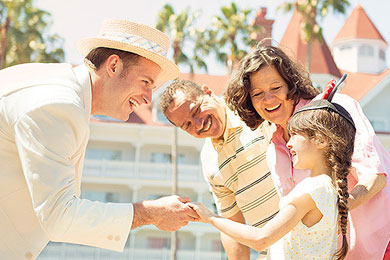 In addition, bus service to all parks is availa-ble in front of the Grand Floridian and a complimentary boat service to Magic Kingdom de-parts from the dock near Narcoossee's. Listen to live jazz and sip a Manhattan or side car at Mizener Lounge, located on Grand Flo-ridian's second floor, behind the bandstand. After cocktails -- or instead of them -- don't miss the opportunity to have a date night at Victoria & Albert's. The vibe at Victoria & Al-bert's is Victorian elegance complete with candlelight, a harpist, a selection of 700 fine wines and impeccable service. The menu changes daily and might include truffles from Ita-ly, beef from Japan, poulet rouge from North Carolina and oysters from northern Florida. Reservations for the 50-seat restaurant can be made up to 180 days in advance.